Aquatherm Green Pipe was used for the majority of the project’s domestic water piping system. "We’re finding that once customers use it they are completely sold on it. It’s a matter of their being open to what’s perceived here as a new technology, but it has really been established everywhere else for more than 30 years." Copper prices were at an all-time high and the owner sought a less expensive, long-lasting alternative. An experienced Jimmy Hughes was in the process of bidding a potable water piping job at the Comfort Suites on Stewarts Ferry Pike in Nashville when copper prices were at an all-time high in fall 2008. As owner and president of Hughes Bro., Inc., he has been in the plumbing trade for 37 years and has operated his own business for 27. He has obviously seen a lot of changes, and he’s not afraid to make them himself. Hughes bid the plumbing work at the 65-room, four-story Comfort Suites with copper, CPVC, and polypropylene. In the end the green alternative was selected. “The way we get 90% of our work is that when we do a job it lasts. Once it’s installed, it’s done. But with polypropylene, it’s a better system. When we put it in, it’s going to last forever. I’m putting my kids out of the repair business by using this system,” Hughes said with a smile. While the Aquatherm system forms joints that are extremely durable, there is a bit of a learning curve to working with it. The heat fusion process is quick and simple, but proper training is essential to Aquatherm’s durability (Aquatherm-trained and certified installers are also able to offer the company’s 10-year warranty). The pipe and desired fitting are simply inserted onto an Aquatherm welding device and heated for a specified time (typically only seconds), then joined together. We’re finding that once customers use it they are completely sold on it. It’s a matter of their being open to what’s perceived here as a new technology, but it has really been established everywhere else for more than 30 years. – Jimmy Hughes, Owner and President, Hughes Bro., Inc.
Once fused, pipes and fittings have the same physical properties, eliminating systematic weaknesses. Additionally, a faser-composite fiberglass layer in the pipe reduces linear expansion of the pipe by 75% compared to other plastics, and ensures that it hangs rigidly. In November of 2008, after renting a few Aquatherm fusion welding tools (a manual welding jig for the 2 ½-inch pipe sections, and a handheld welding tool for the two-inch and smaller lines), Hughes Bro. started installing the water piping for all 65 guest rooms and the laundry facilities. Most of the taps for the rooms were prefabricated at the Hughes Bro. shop in about two hours. Hughes estimated that doing the same work in copper would’ve taken a full day’s work, and that the copper tees would have been considerably more expensive. 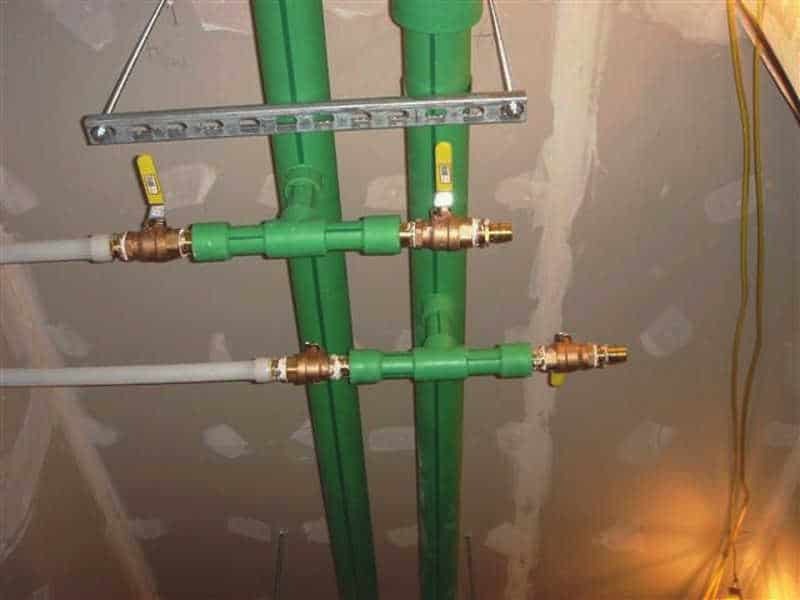 An NSF-certified Green Pipe 2 ½-inch water main runs from State Ultra Force® water heaters in the facility’s mechanical room down the hotel’s main corridors, with 2-inch Green Pipe and 1-inch Uponor Wirsbo PEX pipe and adapters finishing the run to each room. Hughes Bro. installed 35 sets of hot and cold drops, one for every two rooms, and a total of about 1,000 feet of the Green Pipe. In the estimated 400 fusion joint connections made at the hotel, there was only one leak – due to operator error, likely from allowing dirt to get into the connection. Hughes had two different crews installing the polypropylene piping. “A new crew can catch on really quickly and go with it, and that is important with today’s workforce. Also, as they get more experienced with it, they can get even faster,” he said. …But with polypropylene, it’s a better system. When we put it in, it’s going to last forever. I’m putting my kids out of the repair business by using this system. The installation process, which was completed in March 2009, proceeded so smoothly that the company is doing another Green Pipe installation at another Comfort Suites north of Nashville, and Hughes plans to bid every job he can using Aquatherm. He estimated that using the polypropylene saved about 25% over copper, and added that since the polypropylene piping has a natural insulation value of R-1, no insulation was necessary, providing additional savings. Since Aquatherm had all of the proper code approvals for the installation, the hotel’s corporate engineers willingly accepted its use on the project. The hotel is now open for business and the potable water system, running at approximately 65 psi, is delivering water free of the glues, solvents, and other chemicals associated with other piping systems. And Hughes rests easy knowing that he won’t soon be receiving any callbacks about the job – and neither will his kids.